Keno Xperiment Guide & Review - Casino Answers! Keno Xperiment is a science-themed online keno game with special features. Keno Xperiment can be found at online casinos using the Playtech software platform. Keno Xperiment has a scientific theme. This is demonstrated in the excellent graphics, music and sound effects in the game. Playtech is well known for its quality when it comes to the presentation of its casino games and Keno Xperiment is no exception. To play Keno Xperiment, you must first choose your numbers. You can choose up to 10 numbers and as few as 2. Once you have chosen your numbers, you can choose your wager. Payouts will be modified depending on how many numbers you wish to play. Available wagers on Keno Xperiment are $0.25, $0.50, $1, $2 and $5. Your wager will be your total wager per round you play. After choosing your wager, you can choose to play one round or you can play five rounds. The results of each round of keno will be shown at the right in the “Results” box. The amount you have won will be displayed in the box underneath. If you don’t trust your own instincts, Keno Xperiment can choose your numbers for you. Simply choose the desired amount of keno numbers you wish to play and hit “Random Pick.” If you choose to play five rounds, you can set it so the game will generate new keno numbers before each round. It’s a pretty great feature that I find a lot of Keno games don’t include. You can choose the amount of numbers that it will pick too and it highlights it. That’s one feature that makes Keno Xperiment so popular actually – the entire autoplay aspect to it. Not as many Keno games found online offer that with most trying to encourage interactivity. But hey – sometimes we just want to gamble while sitting back and watching a TV show while drinking a cup of tea right? Can US players play Keno Xperiment for real money? It’s tricky these days as it depends on a lot of licensing issues. Best thing is to check with some of the US casinos listed above in the table and see what they have to offer. What other online keno games can I play at Playtech casinos? Playtech Casinos offer a wide variety of Keno games which are changing all the time. Best to check them out! 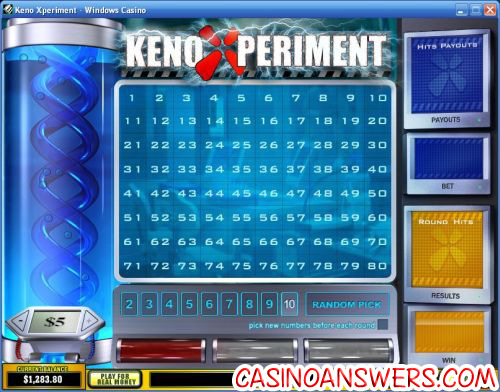 What makes Keno Xperiment different from other variations of online keno? Keno Xperiment is different from other games of online keno due to its unique presentation, the ability to choose numbers at random and play new random numbers after each round played. The biggest feature of the game is its autoplay ability and most keno games don’t offer anything as good as Keno Xperiment in that department.